To begin receiving hospice services, you will meet with members of the Heart & Soul Hospice team. Hospice admissions are primarily done through referral from a primary care physician into the hospice program. Hospice care is appropriate for anyone doctors believe to have a life expectancy of less than six months. At a point where active treatment aimed at recovery stops, hospice care can take over, aiming instead at producing the best possible quality of life in the patient’s remaining time. Every moment counts, and every day can still be emotionally and spiritually fulfilling, dignified, and as free from pain and stress as possible. The decision to start hospice care is usually a joint one, made with doctors and nurses, family and loved ones, and wherever possible, the preferences of the patient first and foremost. Before you begin receiving hospice care, the specially trained staff at Heart & Soul Hospice will meet with you and your physician. 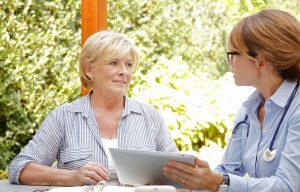 In addition, our staff will speak with you or your loved one about the hospice philosophy of care, pain and comfort levels, support systems, financial and insurance resources, medications and equipment needs. The hospice benefit is available to anyone with a life expectancy of six months or less if the terminal illness or disease runs its normal course. There are many situations when hospice is appropriate. Coverage for hospice care is provided by Medicare, Medicaid, Tricare (a military service member and family benefit) and most private insurance as long as certain criteria are met. Hospice care includes home visits and all related medications, supplies, and equipment for easing pain and providing comfort. Your doctor has told you that you have a terminal illness. Difficulty in recovering from a recent illness. Needing more help with bathing, dressing, getting out of bed, walking or eating. Frequent visits to the hospital or emergency room in the past six months. Feeling weak and frequently tired. Starting to take medication to lessen physical pain. started taking medications to lessen physical pain? needed more help with bathing, dressing, getting out of bed, walking or eating? experienced weight loss so that clothes are becoming looser? noticed a shortness of breath even while resting? been told by a doctor that you have a life-limiting illness? If you answered “yes” to several of these questions, Heart & Soul Hospice may be able to help you. Contact our Wichita and Newton office at 316-652-6212 or our Farmington office at 573-756-7066 or send us an email.